Now, it’s time to move history to the next step. Imagine a light table or tracing paper for sculptures. With mixed reality, you can create a perfect sculpture by tracing a 3D hologram. 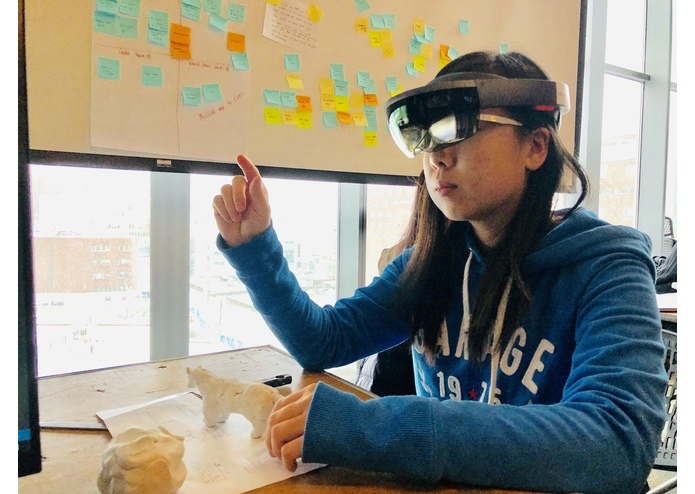 This HoloLens application projects a 3D model onto your table for you to trace, and guides you through the sculpting process step by step starting from a basic model. You can increase the level of detail progressively. We believe this tool will be very useful in education, art practices, and for anyone creating a personal gift. You can sculpt your favorite characters or anything your passion guides you! Plus, utilizing hand gestures and voice commands, you don’t have to touch your computers/book/model references with dirty hands! In the first 5 hours, we focused mainly on the problem space, brainstormed the project blueprint template that we learned from the PTC workshop, and designed our user journey + UX storyboard. After having fun talking about multiple solutions and doing UX roleplaying, we prioritized and narrowed our list of features! We ranked the features based on 1. Impact, 2. Technical Challenge, 3. Art Vibe, and 4. Innovation. Then, we assigned each other tasks. Our youngest team member took the initiative to learn about 3D modeling. Our designer guided us in the UX journey and designed various components. Our two developers learned Microsoft HoloLens development on the go and turned our idea into fruition! We ran into various challenges. The most frequent one is version mismatch and “breaking” changes in our application’s dependencies (e.g., some require C# 4.6 experimental vs 3.5 stable, some APIs got deprecated in Unity 2018, and many more). Mixed reality development is a rapidly growing field and every new update seems to significantly alter the development process. We also ran into problems with the HoloToolkit and vuforia. In the future, we hope to successfully integrate computer vision technology to this application so that it can provide continuous feedback on the user’s performance. While sculpting, you can get scored on how accurately you are following the model and can receive constructive feedback+hints to improve your skills! Sculpting is a time-consuming process that requires lots of patience and high attention to details. We believe our mixed reality application can educate a wide range of aspiring artists and spark interest in the future generation of creative sculptors!